Has Anyone Found a Lost Comet?! Editor’s note: This article, written by AAS Media Fellow Kerry Hensley, was originally published on Astrobites. Nearly two hundred and fifty years ago, Charles Messier, renowned comet hunter and chronicler of deep-sky objects, cataloged the passage of the first known Near-Earth Object: comet D/Lexell. Calculations of its orbit revealed that the massive chunk of ice and dust had hurtled past Earth at a distance of only 1.4 million miles — just under six times the Earth-Moon distance. It was due to return within the decade but was never seen again. How did we lose a comet?! In the following several decades, a trio of scientists independently showed that a rendezvous with Jupiter likely threw D/Lexell into a new orbit — and possibly out of the solar system entirely. While the mystery of D/Lexell’s disappearance has remained unsolved since, modern astronomical and computational methods might be able to crack this cold case. In today’s paper, authors Ye, Wiegert, and Hui describe their efforts to retrace the steps of the first-discovered Near-Earth Object. They begin with Messier’s record of the comet’s passage, which encompasses about three months in the year 1770. Messier tracked the comet’s progress across the sky, usually aided by a refracting telescope but occasionally making the measurements by eye (once excusing himself from a gathering at the Minister of State’s house to do so). 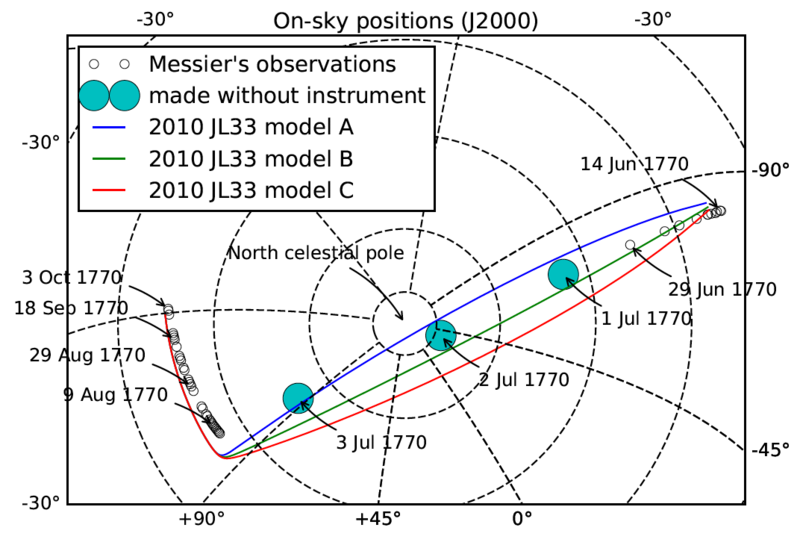 The authors used Messier’s observations to reconstruct the comet’s orbit as it was two and a half centuries ago. They assigned reasonable errors to Messier’s measurements and propagated the motion of 10,000 “clones” of D/Lexell forward to the year 2000. This process took into account the gravitational nudges from the Sun, Earth, Moon, and seven of the planets — the exact sort of interactions that were thought to have thrown the comet off course. The authors found that it was very likely that the comet remained in the solar system; as shown in their simulation results in Figure 1, only 2% of the clones escaped the solar system or were lost in collisions with the planets or the Sun. 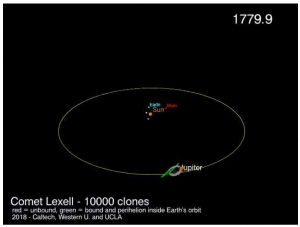 Even more exciting, of the remaining 98% of clones that remained bound to the solar system, roughly 40% had orbits that brought them close to Earth. This result persisted even when they considered non-gravitational effects such as the release of jets of gas and dust as the Sun warmed the comet. If the comet hasn’t left the solar system… where is it? Is D/Lexell Masquerading as Another Object? 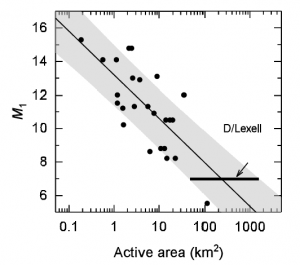 In his observations, Messier kept track of D/Lexell’s brightness over time. Combining the apparent magnitude with known values for its distance from both Earth and the Sun gives its absolute magnitude. Choosing reasonable values for its total active area — the amount of its surface that is releasing gas and dust — based on the relation shown in Figure 2 and combining this estimate with a typical value for the active surface fraction, they find that the comet has a diameter on the order of 10 kilometers. A comet of this size should be detectable by modern surveys, even if it is no longer actively shedding gas and dust. 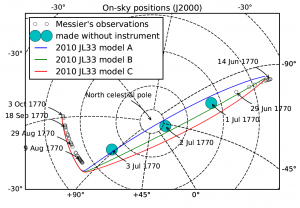 The authors propagate the orbits of known Near-Earth Objects back to the year 1770 and compare them to Messier’s observations of D/Lexell’s orbit. While the paths of four of the objects known today line up with the orbit of D/Lexell, a statistical analysis revealed that only one case of orbital alignment (that of 2010 JL33) is unlikely to be a coincidence. However, as Figure 3 shows, even applying both constant and time-varying non-gravitational effects can’t bring the orbits of D/Lexell and 2010 JL33 into perfect agreement. While it may be possible to find an orbital solution that links the two objects, the authors acknowledge that proving the solution to be unique might not be possible. Although no known Near-Earth Objects have orbits satisfactorily similar to that of D/Lexell, we don’t have to declare the search over. 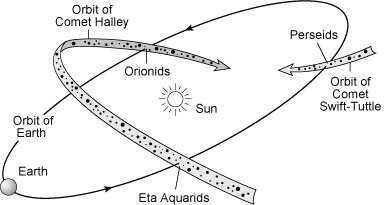 Comets leave traces wherever they go by shedding dust as they travel; when cometary dust passes through Earth’s atmosphere, it produces meteors (see Figure 4). Could meteor showers betray the location of D/Lexell? The authors scoured modern meteor surveys and historical records such as the Draft History of the Qing but came up short. This could mean that D/Lexell’s orbit evolved to the point where it no longer crosses Earth’s path. However, the authors show that the dust-trail orbits vary more widely for comets in close-in orbits, so even if the comet still crosses Earth’s orbit, its trail of dust could have been dispersed through gravitational interactions. While D/Lexell still eludes modern astronomers, it’s possible that future observations of meteor showers could place further constraints on the comet’s orbit. Having given astronomers the slip once more, D/Lexell is free to wander the solar system unidentified. For now.